(LtoR) Girl unknow, Diane (just behind Leslie), Keith Grant, Elaine Dunnell (landlady of Bull Hotel, Wrotham, Kent) and Ann-Marie (her young daughter, sporting a fun hat). circa 1985/86, (Leslie played every Sunday lunchtime – sometime with Keith on drums). I would like to tell about our wonderful friendship with Leslie Baguley, who wrote the song ‘Nice to Know You Care’. He had written a few hits in the 50’s and was such a talented jazz pianist. He was a lovely man, no taller than 5foot, but with such a humungous personality – wearing a 10gallon Stetson hat (which we now possess). Leslie was born in England’s West Country, but was brought up in America. With his wonderful pseudo-English accent, you couldn’t help warm to him big time. Keith and his business partner, David Capstick had employed Leslie to play piano every evening in the Steering Wheel Club in Curzon Street, Mayfair, London. Nearly 30 years ago, Keith and I would take him to play piano (with Keith accompanying him on drums) in The Bull at Wrotham, Kent. He was so popular where-ever he played, often being asked to play at this or that function. I remember the Lady of the Manor asked for him to play for her at the Manor (he played classical music on her lovely grand piano). When he was taken ill, he phoned Keith and said ‘I’m sorry, I can’t make the gig, I’m dying’ and he did. That’s a pro musician for you. His funeral took place at Elmers End, South East London and the little chapel was absolutely packed with so many stars. His friend, with whom he wrote ‘Nice to Know You Care’, namely Normal Newell, (b.25jan1919, OBE-2003, d.1dec2004) came over (especially for the funeral) from America. He told us they had appeared on The London Palladium in the ‘50’s, but had been too zany for that time. He proceeded to tell us a couple of jokes, so there was plenty of laughter. The London Savoy Hotel’s famous resident pianist and his singer wife (whose names escape me for the moment – sorry, will correct later) played and sang for us and we applauded (not done at funerals in those days). Even his taxi driver (who took him home from London to Hayes, Kent each evening) attended. Keith quite expected the coffin lid to open up and say “I’m back” (he would always tell me ‘I’m dying Diane’ when in our car – lie down, then pop back up and say “I’m back again Diane”). Obviously everyone went to the pub next door. Then six or eight of us decided to have a drink at the Bull in Wrotham, to ‘say our farewells’. Keith, David and I did not manage to escape. We got snowed in for a week!!! Our bar bill came to £649 (having already spent £3or400 on the day). Quite lot of money in 1987. The best ‘wake’ we have ever been to! P.S. A special thanks to Bob Dwyer’s Bix & Pieces, who played Leslie’s song ‘Nice to Know You Care’ on 28 March 2014 (see the write-up for that date). 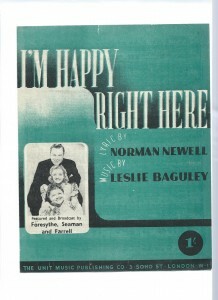 ‘I’m Happy Right Here’ (1947), Lyrics by Norman Newell, Music by Leslie Baguley. Featured & Broadcast by Foresythe, Seaman and Farrell. ‘Nice To Know You Care’ (1949), Lyrics by Norman Newell, Music by Leslie Baguley. ‘Come Home To My Arms’ (1956), Words by Emily Jane, Music by Leslie Baguley. 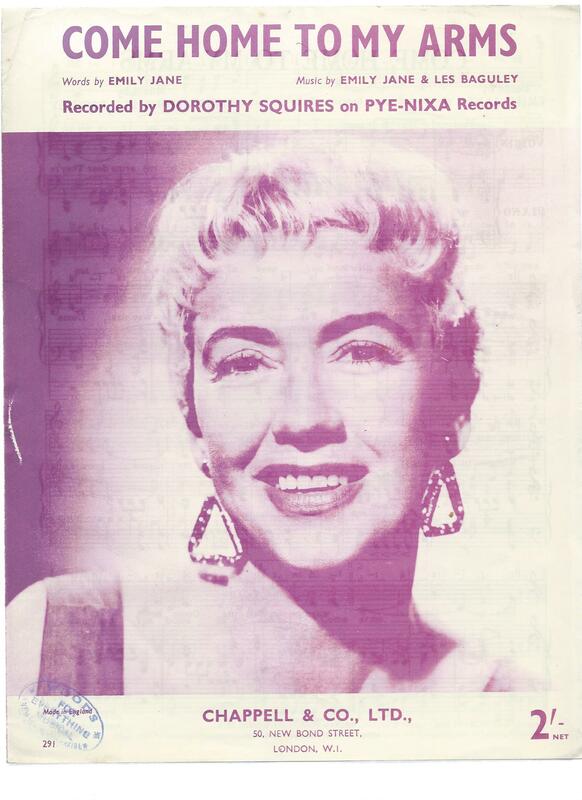 Recorded by Dorothy Squires on PYE-NIX Records. (Dorothy wrote under the name of Emily Jane. Most of you know, Keith (being a luddite) hates computers, but the power of the internet, although can be terrible, it is also wonderful in many ways, hearing from Craig being one of them. So lovely to have heard from you Craig. I have just spent a wonderful hour or so reading all about Les Baguley on the net! Thank you to your website for dedicating a whole page to him. I have followed through and found your YouTube sites with NICE TO KNOW YOU CARE. And I have found a site to buy the sheet music. I’m looking forward to singing it! Your websites bring back memories of the amazing Les Baguley playing at Macready’s Actors’ Club in Covent Garden in the 80s. I was playing and singing there in the early 80s, and then Les took over from me when I left England to work overseas…….. which I think should read that I was the support act to him being the real star!! Whenever I was back in London I used to love listening to Les play, and of course I would always request him to play and sing NICE TO KNOW YOU CARE. 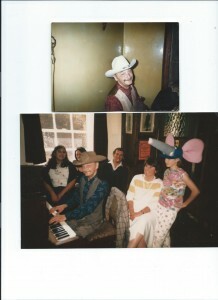 In 1985 my parents visited me in London where I was playing and singing at the Bombay Brasserie. I took them into Macready’s, and my father was able to meet Les. Dad is now 92 and in a nursing home after a lifetime dedicated to music through teaching high school children and occasionally accompanying. He was not a jazz musician, but was thoroughly able to appreciate Les’ dexterity on the piano! And of course Les’ very generous nature was most welcoming, and he and Dad got along very well. The next time I was back in London I looked up Les, but sadly he had passed away. He had always promised me his black and white striped jacket, which was given to him by actor Jack Buchanan. Somewhere in my photos I have a snap of me wearing the jacket! Meanwhile here are 2 pix, one of 71-year-old Les at the Green Room Club for Patrick Ide’s 69th birthday party on 23rd March 1985. And the other is of my then 63-year-old father John McMenamin playing “Les’ piano” at Macready’s in 1985. 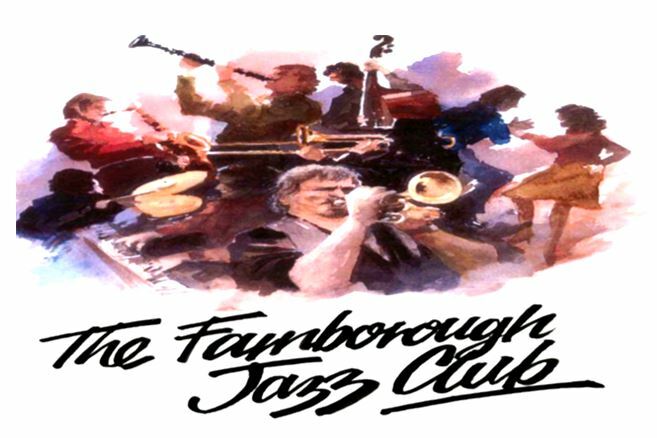 Sadly Macready’s is no longer there……..neither is the Green Room Club…….neither is the piano in the Bombay Brasserie…….. Thank you again for all your info about Les. He was a most amazing pianist and a wonderful soul. I was delighted to come across the website of Leeds Play Bills, where I found copies of old posters advertised for sale. Amongst them, was this posters of Jack Parnell’s presentation from Monday, 13th December 1954. 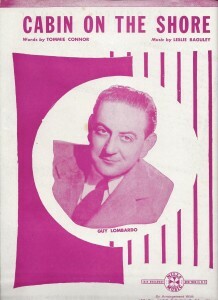 The show was presented by Stanley Dale and included Leslie, playing piano for Tony Brent at The Empire Theatre, Leeds. Description: Monday, 13th December, 1954. It has given me much pleasure to obtain this poster for our website, for all Leslie’s relatives and friends to see. I am sure you will also love their website and to discover all the various posters they have thought to retain and have copies on sale. Well done Leeds Library and Leondis. Their site is making available all the playbills in the Local Studies Library collection from a wide range of Leeds Theatres, such as The City Varieties, The Grand, The Princess and the Theatre Royal. The site also contains some circus bills, such as those from Pablo Franque’s Circus. They also have an image by Louis Le Prince. It is claimed Le Prince filmed the first ever moving images on Leeds Bridge in 1888. The Leeds Playbills site is part of the Leodis digitisation project funded by the New Opportunities Fund. Leodis is a photographic archive of Leeds. It is a project delivered by Leeds Library & Information Service. All images are © Leeds Library & Information Service unless otherwise specified.